A Valuable Gift Giving Resource! Give gifts with imagination and impact! 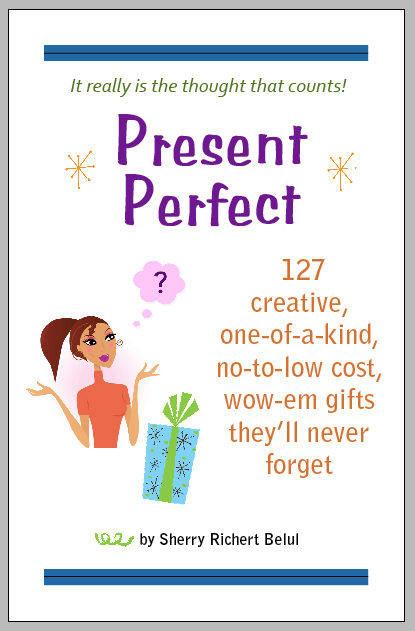 Present Perfect is a priceless resource for any gift giving occasion. It contains 127 creative (not crafty!) ideas for unique gifts that will deepen relationships and not clutter up homes. For just $10 you get 127 ideas for creative, unusual, and affordable gifts to make or buy. If you want to “wow” someone with a unique gift, this ebook is perfect for you. Please note: If you have a PayPal account, after you check out you will automatically be redirected to the download page. If you experience any difficulties, please click here to email us right away! If you DO NOT have a PayPal account, you can make a secure payment with your credit card and a link will appear on your payment receipt to download the ebook. Thanks so much for your purchase! At dinner when he opened the card and read the “Love List” inside, he was totally floored. It was an amazing, sweet, fulfilling moment and I couldn’t help but silently thank you for suggesting it in your booklet. I know it’s a really simple idea but it never even crossed my mind to make something like that for him. He said it was honestly the nicest thing anyone has ever done for him, and that it’s something he knows he’ll definitely be keeping forever. This was probably one of the strongest experiences I’ve had where the monetary cost of something means ZIP, while the amount of heart put into it really is priceless.